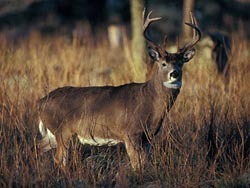 The state Department of Natural Resources is seeking the opinions of deer hunters. With the 2008 statewide deer harvest down by thirteen percent from the pervious year, the state&apos;s wildlife managers are proposing numerous changes in the structure of the 2009 hunt – but they want plenty of input from hunters and the public. DNR big game specialist Keith Warnke says they&apos;ve begun to make changes, based on what hunters have had to say, and they&apos;re hoping to hear much more. There&apos;s a new online survey that hunters can fill out, and there are upcoming deer management meetings . Warnke says all the information gathered will be pulled together and used to make final recommendations to the Natural Resources Board in late April.